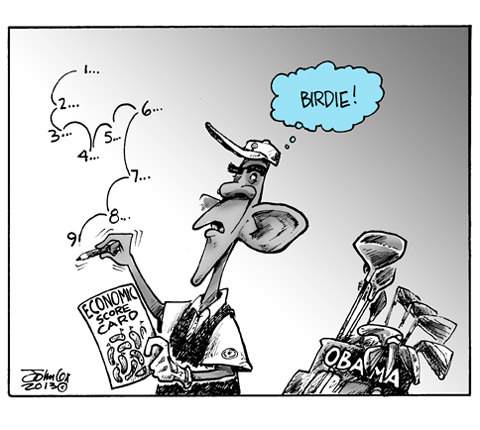 It's nice to know he has his priorities in order as our economic score card is full of double bogeys. I sense an ornithological theme this week. Is it "national refer to birds week" or something? He counts tax revenue the same way. I know where I'd like to put those clubs! Had a jackdaw joke lined up, but now maybe I save it. "I'm having to count unrecorded strokes inherited from, uh... from, uh... Gerald Ford?" So after so much press pressure about golf outings, GWB decided to not play golf after 9-11 to focus on the problems. Where is the press on Berry?????? "Whaaa, what about Tiger?" While I still have a voice, I hate the Pravda Press. This page contains a single entry from the blog posted on February 22, 2013 1:18 AM. The next post in this blog is American Civics Text Book.